Assessing the impact of direct materials procurement trade-offs is complex. And volatile markets, limited visibility and extended supply chain networks further complicate sourcing decisions. It’s critical to sense changes in demand, commodities or supply and respond quickly to protect margins. That’s why supply chain, procurement and finance professionals rely on the SCA Planner™ suite to guide direct materials sourcing decisions on an operational level in real-time. leverage margin visibility to drive collaborative processes like sales and operations planning (S&OP) or promotions planning and execution. Based on years of food industry experience, we have developed patented approaches that improve margins by bridging departmental silos with comprehensive end-to-end analysis. Our supply planning and margin management solutions are designed by food people, for food people, in close partnership with our user community. That’s why quick service, fast casual and other food service providers turn to SCA to help manage billions in category spend. COGS Forecast: With our real-time COGS forecast, chains analyze more dynamic scenarios, with more accurate commodity and inventory data, and immediately see the impact on cost of goods and margins. This more reliable approach improves franchisee and investor reporting and provides proactive visibility of food and paper margins. Risk Management: Risk managers can better balance commodities risk and opportunity by understanding market basket risk in real-time. With early warning signals of changing demand and visibility of cost mitigation opportunities chains can improve coverage and risk analysis. Sourcing and Procurement: With our Sourcing Optimization solution, restaurant chains can continuously optimize farm to fork costs using real-time scenarios with more accurate data and multiple supplier cost structures. Supplier Performance Management: Move beyond current capabilities to integrated, real-time tracking of supplier performance, automatically identifying exceptions and benchmarking suppliers. Results include reduced food and paper costs and faster response time. LTO Planning & Execution: Restaurants can better manage the uncertain demand associated with limited time offers (LTOs) and new menu items with real-time visibility to menu forecasts, sales, supplier and DC inventory, and COGS. Better promotion timing results in higher fill rates and lower obsolescence, helping restaurant chains improve profits. 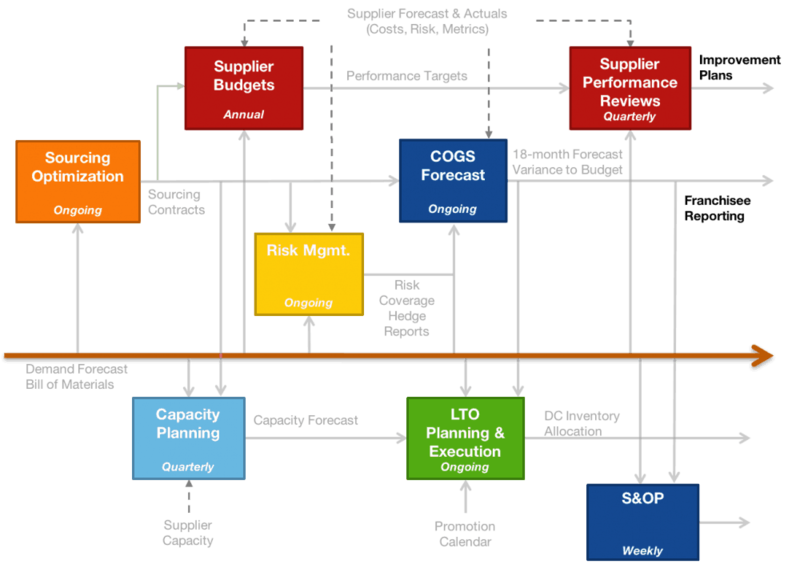 Sales & Operations Planning (S&OP): Restaurant chains can use SCA’s margin-driven approach to meet demand while optimizing the trade-offs between inventory, overtime and obsolescence costs. Chains benefit from improved fill rates and reduced COGS while improving collaboration. Logistics and Distribution: Logistics and distribution teams use SCA’s Logistics solutions to identify, benchmark and reward distributor partners, optimize DC locations and markets and maximize re-distribution opportunities. All while reducing costs, ensuring supply and strengthening distributor relationships. Contract Management: With our Vendor-Customer Contract solution, restaurants can improve food and paper costs with full contract compliance, eliminate price variance with automated reconciliation and manage market risk in line with contract structures. With SCA, you can leverage more timely and accurate data along with detailed cost structures to provide more comprehensive, real-time analysis. Let us put our industry expertise to work for you. Learn more about our client success today.